Nice little bit of baseball arcana. Would you like a few boxes of baseball cards? Clutter in attic had been former coworker’s son’s collection- no idea what is in the mix. Don’t want to throw them away but posting them to ebay seems troublesome. Examples from a box: Pirates, Bob Walk topps 349 June 1984; Phillies, Todd Frohwirth topps 378; Domingo Ramos 622, 1987; Jose Quendo, 68, St Louis Cardinals 1990; Phillies, Steve Jeltz, topps 126, Twins, Dan Schatzeder, topps 218, 1988 I think, needing bifocals or magnifying glass. Appears to be 1980’s mostly. 100’s of them. Not in any order. Commemorative set of 1969 Seattle Pilots has 40 cards. Stuff, it’s so much fun. I will take how can we do this? If you ever really want to know what goes on behind the scenes let me know. I will tell you anything you want to know from the last ten years! Somebody was jealous. You can see forever in his eyes. 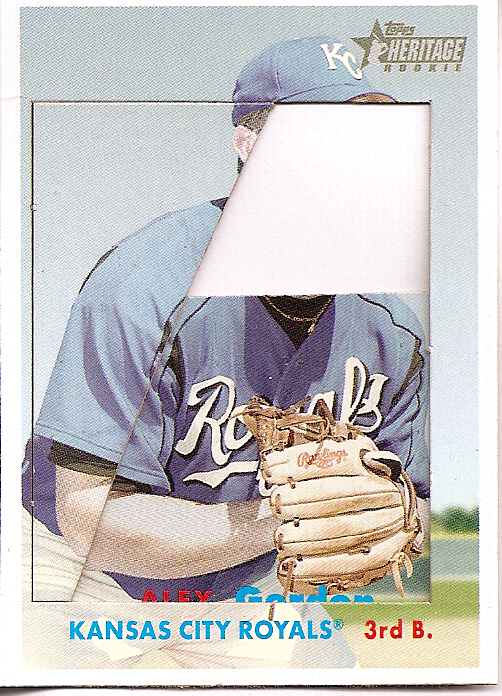 I have one of the 2006 topps #297 cut out cards. I got it when I was in high school (back when I didn’t know much about collectors cards) and I tried to return the pack of cards since one of the cards was a cut out ha. Luckily for me the guy running the card shop where I bought it told me I should hang on to it because it was a pretty rare card. Glad I did! 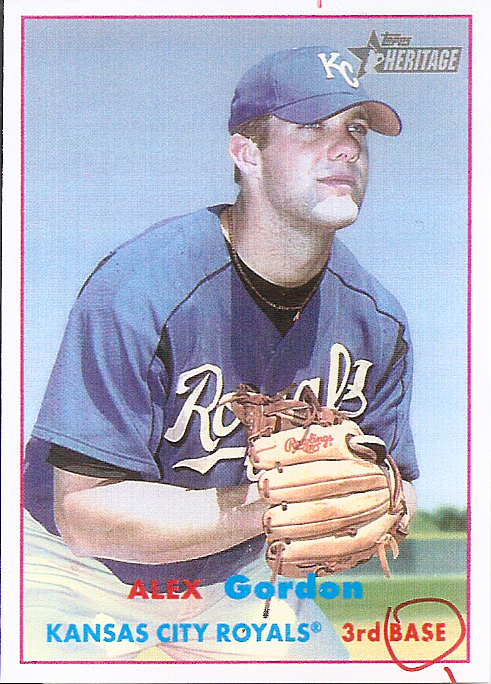 .I too was a part of that Alex Gordon Walmart pack craze in 2007 and spent $1500 on packs to only come out of it with an autographed AG card. Since then I’ve picked up some blank cards, full cards and cut outs. After collecting several of the gold foil blank cards, I realized that the first card I bought in late 2007 or early 2008 of the blank was actually SILVER foil. 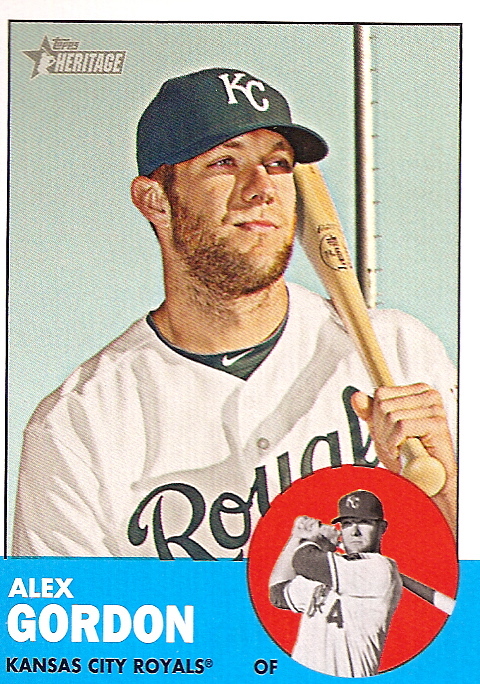 After researching this… it seems it may be the rarest of the Alex Cards from that set… I’ve only heard of 4 from a collector that deals with rare or error cards and he says you, Keith O owns one of the silver foil blanks. IF this is right what I’ve read on Baseball Card Pedia, that there are 4 variations consisting of. This would indicate there may be a scare 5th version? I’m only basing that on the fact it seems the “regular” blank AG card seems to be in Gold foil writing. Ive looked quite a bit and cant seem to find much on the Silver foil blank…. I talked to a collector of error cards and he is the one who mentioned it was so rare and had only heard of 3 other before mine. 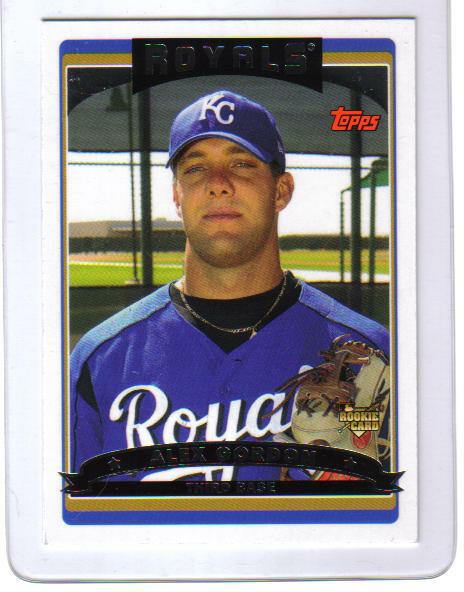 I have a Alex Gordon Rookie Card #297 , when you turn it over the trademark date says 2010. Please tell me this is the correct card. It looks exactly the same. to publish more on this subject, it may not be a taboo subject but typically people do not talk about such subjects.